A delicious collection of renku, renku verses and contributions from poets all over the world. 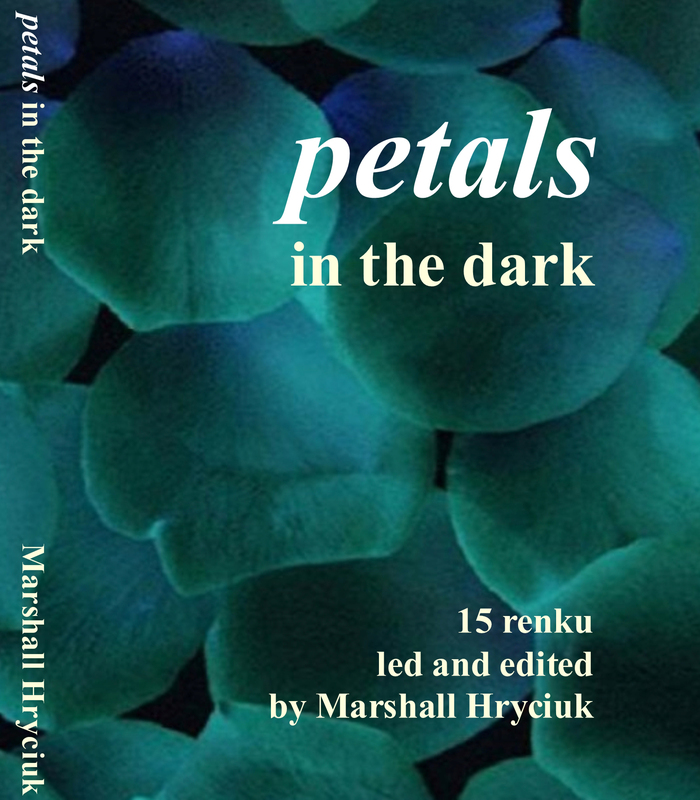 Marshall Hryciuk is a Canadian renku master and we love to brag about him, claim him as our own. And what IS renku. Think of it this way to start: A short verse is given and you as participant are asked to contribute the next verse. This may result in each participant offering a verse, from which the master will choose the most appropriate. He/She will have suggested guidelines for the verse, and your contribution will link to the previous verse, yet shift away from it. In this way, the series is always full of surprise for participant and reader. Example: Say the verse offered mentions water. This is the time to bring to mind anything water means to you. The link can be direct, or subtle. Water may make you think of mist, river, rain, tears, its chemical composition, bottled water, washing, sweat, flooding, colourless, flowing, or a thousand other things. It may suggest a mood, you may think of its opposite, a word like desert. You may think of a connection with a written work or a myth. You may think of a song, or a movie. The master will suggest that the next verse also be about something, such as a blossom or a moon verse, or about media, or unrequited love. Then your water connection becomes more focused. Unrequited love, and water. Cry me a River? The ‘instructions for Marshall’s verse were probably “three lines, romance”, or something in that vein. Karen follows with the ‘yearning’ of cats waiting for darkness so they can do what cats do in the dark. She has shifted from a day scene to an evening one, and away from daily concerns to that of evening possibilities. At the same time, the responding verse leaves open a number of possibilities: new links can be made with the animal world, with what exists in the universe, even into interior universes. Or a link can be associated with waiting, or conversely, with arrival. Part of the fun of renku is that it is meant to be a party. Bring on the saki after the six verse, or the beer and popcorn. Anyone, with or without experience in the form, can participate. This book is a collection of ideas and poems that showcases wit, intelligence, sensibility, pathos and humour. In connecting emotion, memory, and experience, renku dwells on the fullness of being in every moment of our lives. The books arrived today from Marshall! What a beautifully produced book, thank you!